Let's watch it together, the temporarily stolen picture. Chintan looks back over the boundaries of the latter and is rightly concerned. Mom of all and everything, Dhara, continues undaunted to deal with nourishing affections and hopes. Her older daughter, Sati, is studying her mother, studying as a mother, studying how to face the fate. The little one, Ahir, is also staring at the world beyond the deformed side of the mirror, as his older sister Padma too. Nevertheless, different moods and light are woven into their gaze. Chintan has got the fundamental task of adding the decisive dimension to the apparent inertia of the image, to remind us that that photo tells true life, despite the poor resolution of common empathy. 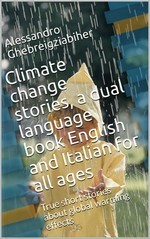 Climate Change Stories is a magazine of in-depth analysis on current events that through stories inspired by real events tries to stimulate readers to look at the latter from other points of view.